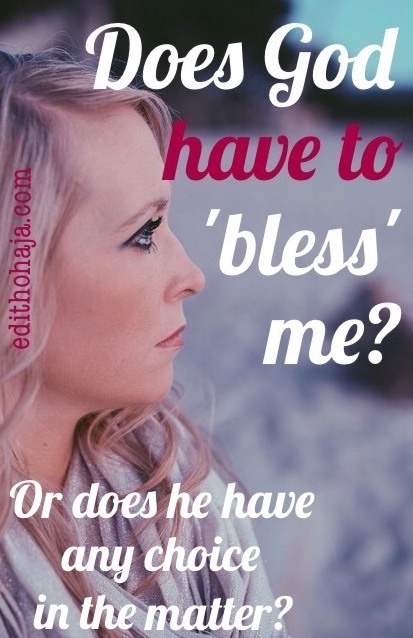 DOES GOD HAVE TO ‘BLESS’ ME? Or does He have any choice in the matter? For many believers, to be “blessed” means to receive relief from their problems and acquire the pleasures and comforts of life. In this regard, Christians have different conceptions of God. To some, He is a strict and holy God who must be revered and never troubled for temporal matters. To others, He is a sort of Saint Nicholas or if you like, a doting grandfather who can never say “No” to them. Both perceptions have serious demerits as we shall soon see. Later, I began to ponder over this and ask myself if this attitude was supported by Scripture. Does God promise us in His word that He is compelled to move in our situation? Does He vow to end our trials when we feel we can’t take them any more? In other words, does God have to “bless” us? Or does He have any choice in the matter? A close reading of Scripture would show that such an attitude is actually erroneous. Please don’t get me wrong. I’m not trying to misrepresent God or undermine our faith. But I don’t want us to set ourselves up for disillusionment from time to time. An explanation is imperative and I present it below. I want you to consider it very carefully. a misunderstanding of how God demonstrates His love for us. 1. Let us start with the person of God: Part of what it means to be God is that He is sovereign. He does not have to do anything. He cannot be compelled. He is self-existing and does what pleases Him. Except we understand this, we may develop a grudge when in spite of our insistence and meeting certain conditions which we feel will certainly bind God to do what we ask, He remains silent or seemingly inactive. I have heard believers recount how they served God tirelessly and sowed seeds for certain expected blessings. The truth is that some come to testify later while many others become discouraged because things didn’t turn out as they hoped. We should not presume to dictate to God. We ought to bow to His sovereignty. Sometimes, God does as we wish if we insist long enough but this is usually an invitation to heartache and misery further down the road. Remember the Israelites’ demand for kings and how these kings became so oppressive and led them into idolatry that eventually resulted in exile. It didn’t even take many generations for this to happen. It started right with Solomon, the son of David. (I Samuel 8:6-21, 1 Kings 11:1-8). Okay, with everything spelt out like this, what could possibly stop God from doing what I ask for when it’s taken straight from the pages of the Bible? His promises in the Bible are His will, aren’t they? They are in a general sense but may not always be so in each specific case. Take, for instance, the issue of healing. The Bible tells us that by the stripes of Jesus we have been healed (I Peter 2:24). Apostle Paul knew it. He probably preached it and performed outstanding miracles in that respect. But he had an affliction which, rather than remove, God gave him the grace to endure for a reason that our human nature would find hard to appreciate. “So to keep me from becoming conceited because of the surpassing greatness of the revelations, a thorn was given me in the flesh, a messenger of Satan to harass me, to keep me from becoming conceited. Three times I pleaded with the Lord about this, that it should leave me. But he said to me, ‘My grace is sufficient for you, for my power is made perfect in weakness.’ Therefore I will boast all the more gladly of my weaknesses, so that the power of Christ may rest upon me.” – 2 Corinthians 12:7-9. Paul felt he couldn’t take it anymore but the truth is, we don’t know the extent of our endurance (actually God’s grace upon us) or what the consequences of the options we are asking for are. Only God does. Take something else, like procreation. It was the first command given to human beings in the Bible. Does that mean everyone must reproduce? God’s will for certain persons, as shown in the Bible, does not include biological parenthood. We know this was the case with the Lord Jesus and the Prophet Jeremiah. So picking Bible verses as we wish and being adamant that God must fulfil them in our lives can open us up to serious disappointment sometimes. A more productive way to pray is to ask God to reveal to us by His Spirit what His will is for our lives and to pray accordingly. This can be done by praying in the Spirit or praying and remaining calm in our hearts to hear what God has to say. Never feel that hearing from God is for some exclusive class of believers. God can simply stir a scripture in your heart that gives you the idea of what He wants to do. You will know that you have been inspired to hold on to that scripture. 3. Now, all this might be sounding gloomy to some. Someone may therefore ask, “If we can’t get what we want through Him, what’s the point of serving God?” You see, that’s the problem. God is the Creator and Ruler of the Universe. By that fact alone, He deserves to be worshipped, even if He doesn’t do the things on our wish lists. God is so much bigger than someone to get money, clothes, food, spouses or whatever else we need from. He is our righteous Father and He longs for us to reflect His nature more and more. To be clear, God loves us beyond anything we can imagine and He does want the best for us. This is unlike the babalawo who will give a woman a love potion for her husband that may end up killing him or driving her mad when it boomerangs. But the fact is that God’s way of viewing things is often far different from ours, with the result that what He considers good for us may be something we loathe or something that is not pleasant or comfortable. We need to understand that God loves us as much in the hard times as in the good times and often uses the hard times to refine and help us mature in faith. If God’s love is only demonstrated through cosy experiences, then He must have hated the prophets and martyrs whom He watched while they were killed for their faith. God loves us very much and will take care of us but everything must be on His own terms. Otherwise, we could get fleeting goodies and thrills that may not facilitate our walk with God. God is a doting father but you won’t manipulate or control Him. He is the Sovereign Lord. Know God personally. Let His word fill your heart. Pray for your needs but don’t do it with gritted teeth, wearing yourself out. Rather, do it in the confidence that God will work things out, maybe not always as you wished, but always for your good. Do not give God ultimatums or struggle with Him. Instead, rest in His will as the Lord Jesus and the apostles did. I love you with the love of God and I want you to know that it is well with you in Jesus’ name. Hi! I welcome your thoughts on this post. Ma, I really want to thank you about this post. I have learnt not to pray with compulsion but pray according to the Scripture and as the Spirit of God directs.. But I also want to add that God being a sovereign being knows all our heart desires and we only need to obey him, work with him, believe in him, trust him and all other things will work according to his plans. Because he made it clear that before we were concieved in our mothers' wombs, he knew us. So we jst have to believe and trust him.. Very well put, Emeka! You are superbly blessed in Jesus' name. That is true, Rita! We go through different seasons and we need to understand that in our relationship with God. Have a very beautiful week in Jesus' name. Yes, we should. And thank you, Chinwe. 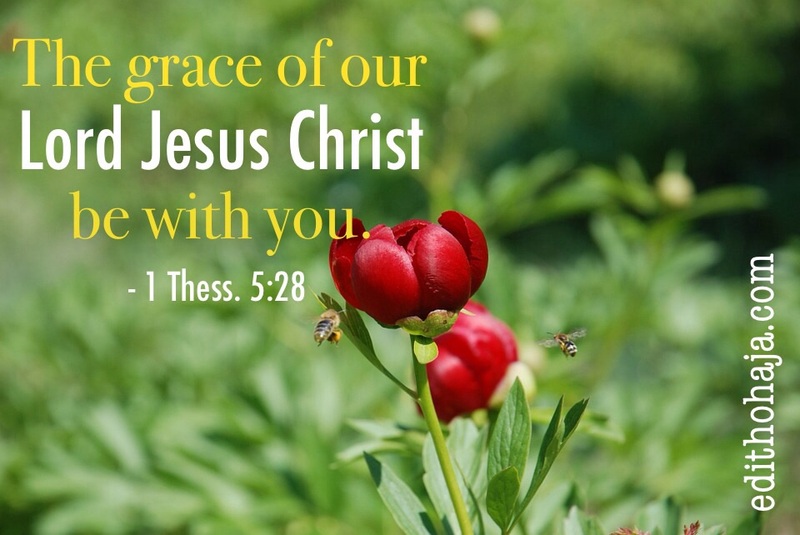 Glory to God and abundant grace to you in your projects. I have heard people take that stand that God has to give this what they want, they "deserve" the best materially etc.... That is an arrogant stance to take towards the Almighty God. And I believe it is definitely part of Americanized Kristianity, not Biblical Christianity. Individuals who seek what's in God's hand instead of God Himself. Individuals who fail to realize that what we deserve is death, and death is what we'd have if not for God's Grace (His undeserved favor)! Good post with a much needed message. Thanks a lot for coming over, Juanita! It's actually quite a popular stance in contemporary Christianity that extends far beyond America. May God help us to walk in the wholeness of His counsel, not cherry-pick the Scriptures. Goose bumps. Goose bumps. Goose bumps. I have no words. Thank God you wrote this, thank you for writing it. I'm so blessed, Edith. God bless you. What a most edifying piece for today. Glory to God! I thank Him you found it a blessing. I just saw that you shared it on Facebook. I really appreciate. I pray that God helps many readers not to be defensive but follow me to check the Scriptures on this. Abundant grace in your work and programme in Jesus' name. A believer that sees God as ultra-hard or as a mindless Santa Claus, sounding like he has no option than to do something now does not ask nor pray by his spirit. "A more productive way to pray is to ask God to reveal to us by His Spirit what His will is for our lives and to pray accordingly." That is correct, Tope! Glad to have you here. We should not neglect the ministry of the Holy Spirit in the life of the believer. 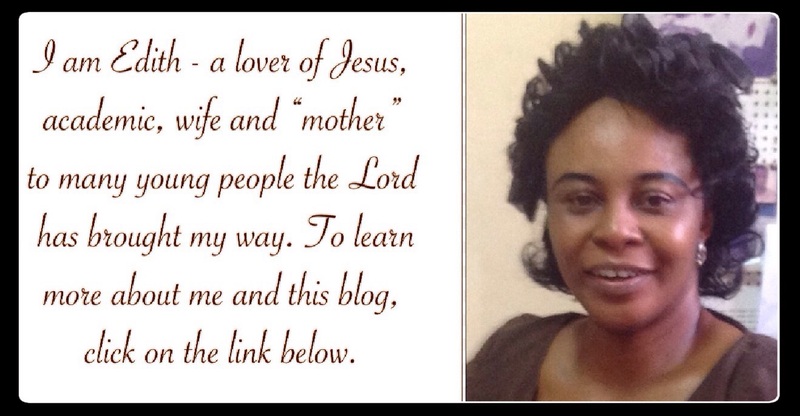 More power to your elbow, my dear, in Jesus' name. When I was going through a rough time recently I learnt to put myself in God's will and let him teach me what He wants me to learn in the pain. I also learnt that His way is the best and that I should never question His way of doing things. Yes, Jackline. That's what Job meant when he said, "When He has tried me, I shall come forth as gold" cutting corners when that is the case will only cause the process to repeat itself, thereby prolonging our pain. You are blessed, my dear! I think so often people have a skewed view of God and mistake Him for their own personal genie! This was such a thorough and detailed post. Thank you for all of your time and dedication for people to know and understand our Lord better! God bless! Oh yes, I remember the genies from Arabian Nights Tales and such. God bless you for dropping by and for your kind comment, Melissa! Hi April! Sounds like an insoghtful book from the title, The Trivialisation of God. May God help us to always understand that He is the Almighty on Jesus' nsme. It just taught me that no matter the pain or challenges I'm going through, it's all for a reason and I'll enjoy it's blessings someday. Glory to God! He works all things out for good to them that fear Him. Absolutely right! All God does for us are out of his tender mercies and compassion towards us. If God were to count iniquity, none will stand and then we will realize that we do not merit half of all he does for us.For even our righteousness are like filthy rags before him so it is not of works, least any man should boast. We should be grateful for the favour he shows us and not be authoritative about it. Most times, we think asking something from God by force will make Him answer us. Talk to Him, He is a loving father and He understands.I pray sins don't hinder us from getting the blessings God reserved for us. Well spoken! I wish some people can have access to this write up, those that feel like they can command God the way they feel or want, forgetting that he performs his miracle from his desire to do so for u. He does it for you out of his divine love, him delaying to respond to you doesnt mean he has forgotten you but u should be steadfast for his favour is boundless. all we should do as Christians is to obey his command as to be part of those that he 'll always remember in his good will. Thanks ma. For me, this is a new revelation on the person of God. Thanks for this. Very thoughtful. God is indeed always with us Even when we don't seem to notice he presence and undying love, he shows us in every other way: when we sleep and wake up healthy. Thank you, ma, for being an inspiration to us by teaching us what we seem to ignore most times. Gods blessings are ever true in our lives and the only thing that we should do for God is to trust and obey him. if we do that, the blessings of God will continue resting upon us. lord knows our heart desires already, and he also made us to understand that we should make our request known to him through prayers and supplication but again, we should remember that Gods blessings come to us when it is necessary. Boom! boom! So it sounds to me. A perfect, sound and timely message. Bravo Aunty! God blesses every one as far as you are alive. good health is the greatest of all the blessing of god. whoever HE said will live will live irrespective of your title, profession or church you attend. then every other blessings are added unto you according to your hard work. for he who created us loves us and can never ignore us in the times of need. I know it's hard when we pray & not get response immediately; I believe God has plans for every living soul he put on earth. God is not obligated to bless us, but He blesses us anyway. He overlooks our flaws. He is merciful and kind. This is an interesting and an eye-opener to many. God is a sovereign , the almighty, who is God all by Himself and has been God before man came into existence. His only because He is love that is why He cares for us, lifts us and blesses us when He pleases. He does want he wants ; he can bring or lift anyone for His own reason. This is a great piece for everyone that we may learn how to humble ourselves to WAIT on Him . Giving Him thanks for all things. God blesses His children, Yes, but when He wants and in His terms. We only have to obey and His love makes Him bless us at all round. God has to bless us but he has a choice to make on whether it is the appropriate time for such blessings or if we are to wait. This is when our patience in God's word is tested, all we have to do is pray while we await his blessings upon us. He thoughts towards us is for good and not of evil. Most times we always come to him to make requests but neglect the most important which is Thanksgiving. God has to bless us all, but the thing is our patient is tasted, before Gods blessings be on us, we have to be fervent with kingdom things and when the blessings eventually comes, we will be thankful to God. We are all blessed in our own different, it is just the time for your own blessing to manifest. This was what the bible meant when it said that when we pray and God does not answer us , then we don't know how to pray; we are praying according to our will. The bible admonishes that we pray according to the will of the Father.Our God is the supreme God; He decides and does things at his own will, not according the will of man. Thank You, Ma for the Insights! Indeed God does not have to do things for us. Butbhe does then anyway because just like a father provides for his family...God our Soverign father provides for and watches over us even though we don't deserve it. But there are times our cups get full and He may want to leave us to our faith but by the stripes of his only begotten son Jesus Christ...we are saved. God is a God of love and God is love, Yes he said in his word "the thought he has for us is that of good and not of evil" this does not in any way put God under compulsion to instantly answer our request each and everytime we demand for his blessings. infact i have come to understand that the fact God does not provide our needs when we ask for it does not in anyway make him partial rather he is teaching us the role of patience and perseverance in christaindom Gods plan will always come to pass at the appointed time no matter how long it tarries. God has a choice in everything about me including my life, by success, favour etc. I believe that He created me for a reason and to make his promise in my life come to pass. He has a choice so in every situation i will always praise and adore him. God is so good!And we have got to praise him no matter what the situation is. God choices are always right even when it does not seem right to men, He does his actions when we do not even deserve it . His blessings come at the appropriate time if only we are patience enough. Humanbeing based on our human nature and flesh always want fast miracle and blessing and when it is not fought coming, we seem to believe that God is not listening but one sure thing is that God always listens to our heart desires but he does his own thing at the appointed time. Gods choices are always the best even when it is not in the eyes of men. He does his things at the appointed time. God's plan is always the best, sometimes things don't go right for us, but God's plan just comes and sweeps us off our feet with his amazing love. there is one thing i have learnt: to avoid the babalawo mentality by all means. always praying for one thing or the other but never interested in finding out if it is his will or if such materialism will simply push us away from him. i also realized that my life will have pains once in a while because i am human and because God wants to make me better. it does not mean he is now a bad God. he is forever worthy of praise and glory. God is merciful,his love is unfailing and his faithfulness is sure,but we can't force God to bless us. Everything works according to his plan. We might need 50k and we are denied the 50k because God wants to give us 200k,but then,we don't know and we keep fooling ourselves thinking God does not want to answer us. He has greater plans,we shouldn't make it a do or die affair. God will bless us surely! God is a supreme being; he is never obliged to do what we ask of him. He does whatever he wants however and whenever he pleases. He knows everything and knows what is good for us and as such, does whatever he deems fit for us. The word of God says that bless are those who believe yet have not seen ,we have to pray for us to receive God's blessings and Anty Edith made us to understand that when we pray and be in good terms with God ,he will bless us by making a way where there is seem to be no way for us. I love the scriptural references you used. God is supreme and does whatever pleases him. So, we should never feel like he has no other option than to grant all our heart desires. Sometimes, God not doing anything may actually be better as we do not know what the future holds. Also, we should ask according to God's will in our lives as he will certainly fulfill his word. He will always make the best decisions for us. Thank you for sharing. God loves us all and sees our situation and listens to our prayers, he knows when to attain to our problems, Most times, God uses such times to test our faith. I believe he can’t forsake us, he knows the right time, if only we believe in him and obey his commandments. He knows when and how to do it. We must be loyal to him. This motivating ma and i learnt a lot from it. A lot of times, we insist on what we whatvfrom God, not minding God's view on our request. Thank you ma for this light. Begin with prayer. Start by asking God to show you His specific will for you in that situation, Ask, Does this glorify God?, Does it agree with Scripture? God gave us His Word to show us His will, you and I can trust the counsel of the Bible. Be patient, God’s will is worth the wait, trust His timing. God will fulfill His promises and accomplish His will for you. Earnestly, we have a big God. He knows our in and out. He blesses us when ever he sees the time is right. We should remember that God have something in stock for us. Just like we cannot start ordering and dictating to our earthly parent to do some things for us even though it is their responsibility, is also the same way we should not dictate to the sovereign God. God is no respecter of man, He choose to bless whom He will.